As we know, innovation is often born of necessity. And an expanding orchid collection. The winter of 2016-2017 was one of the wettest — and coldest — that we have seen at our location in many years. We had sub-freezing nights from late November to mid March, with lows regularly dropping into the upper 20s and a few skirmishes into the mid 20s. When I set out to design the space, I initially intended to purchase an eight tube fluorescent fixture. 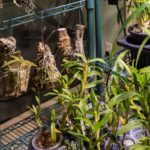 While not enough light for long-term growth of higher light orchids, I figured that it would be adequate for 4-6 weeks during the coldest part of the year — and definitely an improvement on plants crowding the floor of the intermediate growing area. I also considered pressing some of my older red-blue LED grow lights back into service; I had used these over-wintering hibiscus indoors and providing supplemental light. But I couldn’t imagine orchids in the blurple color (see image) and the growing space would look too much like a disco. While searching for grow lights, I came across the term “white light LED” in a menu on a horticultural lighting website. In the intervening years from my experience with the blurple LED lights, technology had evolved considerably. In fact, several companies were embracing the concept of not just extracting the highest photosynthetic responsive wavelengths from the solar spectrum (the blue and red described above), but closely replicating the ENTIRE spectrum in order to simulate more natural light conditions. 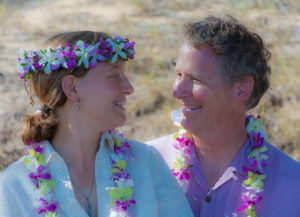 I resonated with the fundamental premise: plants have evolved with the full solar spectrum and, in its entirety, the solar spectrum provides a complete growing stimulus that can’t be reduced to a subset of wavelengths. To provide an optimal growing environment, then, it would be best to simulate the sun rather than fractionalize it. In another article on LED lights for orchid growing, I offer more detail on the specific qualities of horticultural LED lighting, including spectrum, photosynthetic active radiation (PAR), photosynthetic photo flux (PPF), and daily light integral (DLI). Also, I have written about my experience with the conversion of T5 HO fluorescent light fixtures to LEDs. Here I will focus on my indoor orchid growing setup and results using high intensity LED grow lights. The technology has been developing for several years, and high-intensity LED grow lights have a major market in cannabis growing. 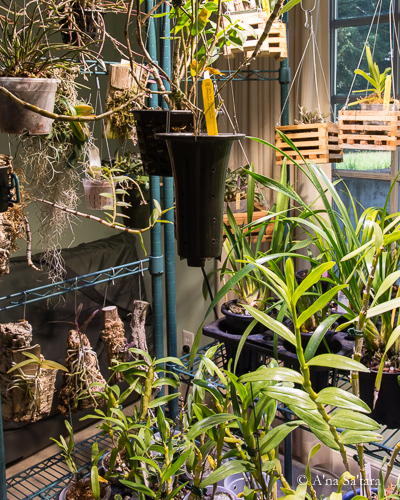 They are also used in indoor atrium displays, mini rainforests, and museum environments. Since the light spectra closely match the sun, colors are vivid and clear — ideal for appreciating the beauty of orchids. A key feature of this particular class of white light LEDs is that they are high intensity: at 30″ below the fixture, they deliver about 2000 fc. Very adequate light levels for growing dendrobium and far superior to florescent light fixtures. The high intensity LED grow lights also have excellent “canopy” penetration — quality, intense light is available at a considerable distance from the fixture. 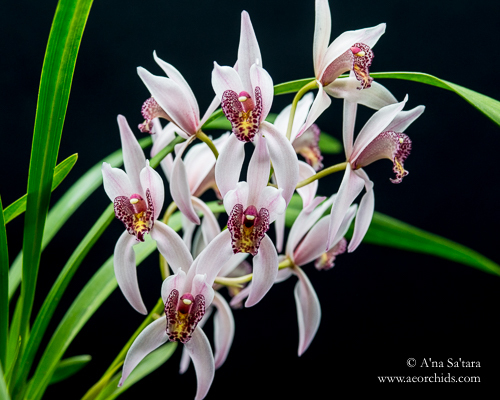 This is in marked contrast to florescent lights where it is best to have orchids less than 18″ in height, and better to be less than 12″ tall, or the light gradient across the plant is markedly different. I’ve seen this with a small vandaceous orchid that winters with my Phalaenopsis under fluorescent lights; the top 4″ of the orchid is rather purplish and the lower part is darker green. 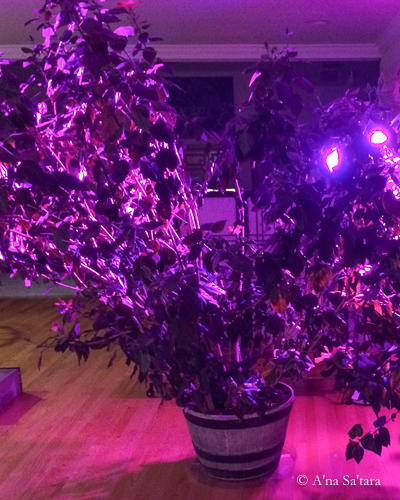 High intensity LEDs are designed to deal with this issue — after all, a cannabis plant can be 5-6′ (1.5-2m) tall. So 2-3′ (0.75-1m) tall dendrobiums and cymbidiums are no problem! After examining several fixtures and manufacturers, I chose the LED panels manufactured by Amare Technology. 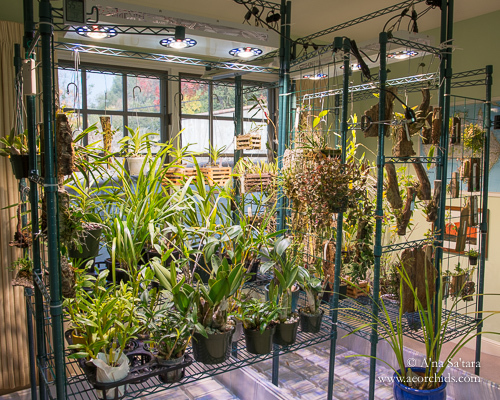 I consulted with them directly, and the SolarPro SP400 was recommended for a 4’x4′ growing space for orchids. Yes! They do understand orchid growing and can convert the light output of the units into footcandles, with precise setup recommendations to produce desired levels. I read one of their “rainforest” application testimonials where the facility had Dendrobium bracteosum blooming year-round. While the initial cost is about triple that of an 8 light florescent fixture, over the life of the LED fixture, it is within 20% when you consider the annual replacement of florescent tubes. An LED grow light panel should last at least 10 years. Straight comparison with a florescent fixture isn’t really fair — the photosynthetically valuable light (PAR) produced by a high intensity LED grow light is in an entirely different category of quality and intensity, making it suitable for a much greater diversity of orchid genera. While seven hour is notably less than I would use a lower-intensity fluorescent fixture in winter (11 hrs/day), the higher intensity LED grow light more closely simulates natural sunlight, and therefore, I do not believe there is a need for longer hours to compensate (which is evidenced by the flowering and growing results reported below). In another article, I describe this more fully with the concept of the “daily light integral” and LED horticultural lighting. 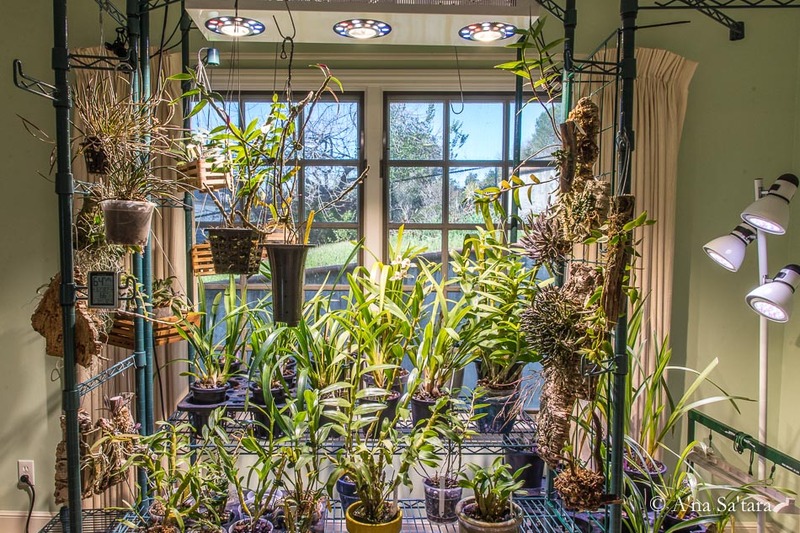 I plan to bring the orchids back outside in the spring, but I would increase the length of “indoor sun” in the warm months if I grew year-round under the LED lights. Cym Cherry Blossom ‘Profusion’, primary hybrid of Cym floribundum and Cym erythrostylum. Flowering after over-wintering in LED light room. There is a 50db fan that runs continuously to disperse heat from the fixture. It is relatively quiet, but noticeable in an otherwise silent house; I wouldn’t want it in the living room. The lights do add a some heat to the room; the temperature drops notably after they turn off in the late afternoon. This works ideally as I can maintain 45F nights and 70-72F days with no supplemental heat in the space (other than central heating in the rest of the house set at 67F during the day). If I close the door to the growing room, it will warm into the upper 70s. You can get all of the tech specs and spectrum information that you could ever want from the Amare Technology website or emailing their customer service … what I can better offer you here is my orchid growing results. (And no one is paying me or giving me a discount for writing this article, in case you are concerned). Simply: I am thrilled and the growing space (and SolarPro SP400) has exceeded my expectations. I won’t be returning to fluorescent lighting in the future. 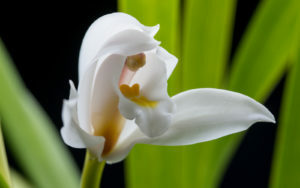 So far this season, I have Cymbidium banaense (eburneum), Cymbidium Cherry Blossom, and Dendrobium loddigesii flowering. Cymbidium schroederi is developing buds on a bloom stalk (just a 1″ spike when it came inside before the first hard freeze). 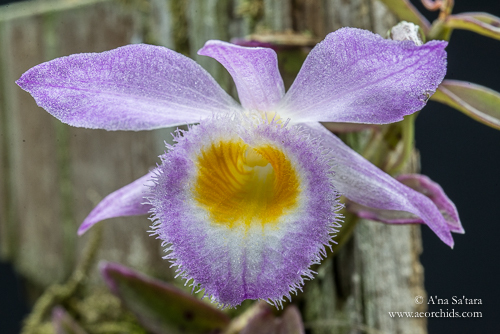 The nobile dendrobiums are filling up with buds, and one is just about open today. Many mounts are now flowering or in spike, including, Dendrobium prenticei, Dockrillia lichenastrum, Dockrillia striolata, and Dendrobium nugentii (Dockrillia linguiforme). Dendrobium victoria-reginae, Dendrobium Eltonese, and Dendrobium cucumerinum are the most vigorous that I have seen them (probably not just because of the lights; the warmer nights and higher humidity are likely more amendable conditions than the outdoor shadehouse). 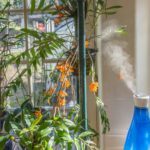 I will update this article later in the season, after the winter dry rest for the Callista section dendrobiums and Barkeria. The Dendrobium lindleyi are hanging just about 15″ under the light panel and show no signs of burning; likewise for the upper leaf tips of the Dendrobium victoria-reginae. The expanded “indoor sun” room for winter 2018, with two high intensity LED light panels. 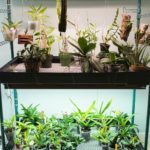 I was so pleased with the growing and flowering results for the over-wintering setup, that I added a second high intensity LED grow light for year-round orchid growing, to accommodate species that thrive with cool temperatures, high light, and high humidity. 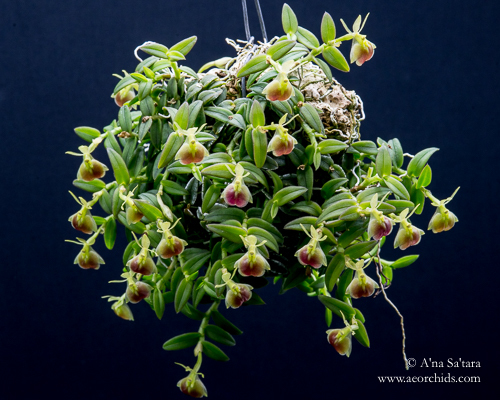 In particular, I have concentrated on cooler growing Dendrobiums from New Guinea and the Philippines, Sarcochilus, Barkeria, and Dockrillia (Dendrobiums) from Queensland, Australia. 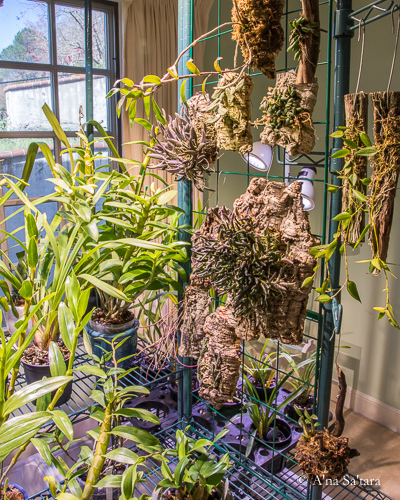 Plus a few high light Epidendrum — at the top of the mount panels, the high intensity LED grow lights actually put out too much light for most Dendrobium species and I wanted to make use of the entire growing area. The growing and flowering results have been superb (see the Epipendrum porpax photo with 21 flowers!). The ease of maintaining the mounts has been enjoyable. The growing area stands in a 4’x4′ hydroponic flood tray, allowing me to mist and water till dripping wet everyday. Once a week, we use a wet-dry vac to vacuum up the excess water. Humidity is maintained at 60-70% and the LED grow lights do not add excessive heat. I use a small fan to circulate air in the room, and open the windows at night for cooling in our 50F (10C) nighttime temperatures. All in all, I would say that my growing results for mounts and baskets have been much better than in the outdoor shade house, in large part to due to the constant high humidity. In fact, most of my shadehouse mounts have migrated indoors permanently after seeing such robust root growth under the indoor LED light setup.